One of the problems with conducting so much work communication via email is that a lot of useful conversation, information and knowledge ends up being locked away inside people’s inboxes, unavailable to the rest of the company. Even worse, if a person then leaves the company, that information may be lost forever. That’s the problem GrexIt is trying to solve with its new app, which is essentially a company-wide knowledge base for Google Apps (s goog) that allows users to move specified discussions from their inboxes into a shared, searchable repository. 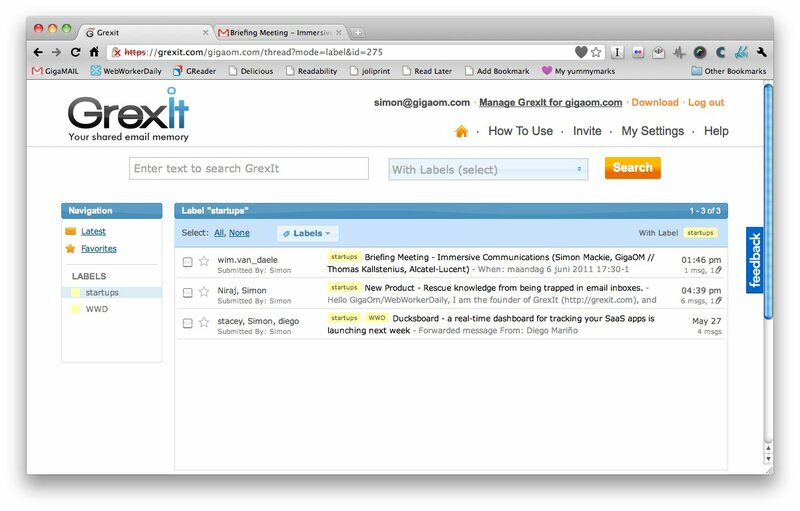 After a user has authorized GrexIt to access Google Apps, moving conversations into GrexIt is simply a matter of forwarding emails to the “add@grexit.com,” or if the user has the GrexIt browser extension installed (currently available for Chrome (s goog) and Firefox, with Safari (s aapl) support on the way), hitting the “Add to GrexIt” button. Once conversations have been moved to GrexIt, they become available to everyone on the company domain. Users can also apply shared GrexIt labels (which work similarly to, but are separate from, Gmail labels) to conversations to make them easier to find later. Users with the browser extension can also search the repository from their Gmail sidebar. GrexIt also has a couple of additional advanced features that make it a more useful enterprise tool. Firstly, admins can specify can specify “Fetch rules” that automatically pull certain emails into GrexIt. 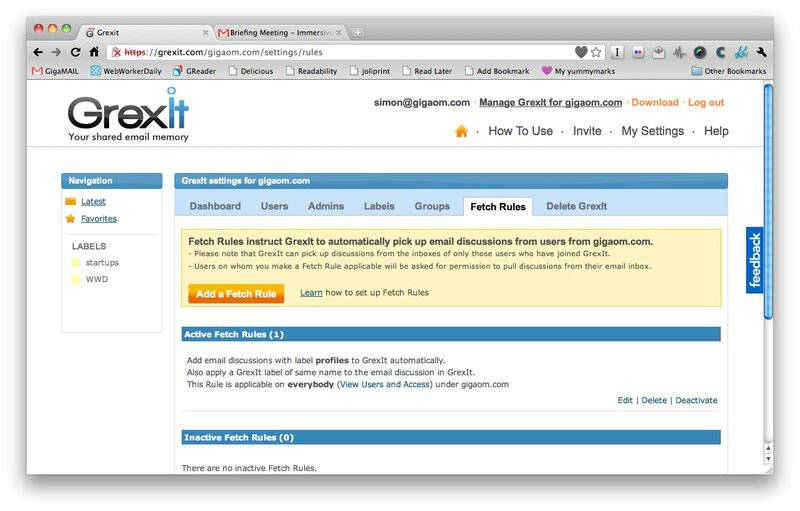 For example, a Fetch Rule could specify that all of the emails in a user’s inbox with the label “Invoices” are automatically moved into GrexIt (note that users are asked for their permission before any Fetch rules are applied). Admins can also set up “Access Rules” and restrict access to discussions with certain GrexIt labels to particular users, or groups of users. Unfortunately, emails aren’t often written with the intention of being stored in a knowledge base for later recall, which may make the signal-to-noise ratio of the GrexIt repository pretty low, and specific information difficult to find. I can imagine that in a larger company the volume of material stored could potentially become difficult to manage. However, it’s still better than having no shared access to that information at all. While the signal-to-noise ratio in a GrexIt repository may be lower than on, say, a shared wiki, adding information to GrexIt is much easier than having to write out wiki content, so it’s more likely to be used by everyone in a company. GrexIt is currently in private beta and free; you can request an invite at the website. When it’s released, it will be sold on the Google Apps Marketplace, likely for somewhere between $1 per user per month to $5 per user per month, according to co-founder Niraj Ranjan Rout. It currently only supports Google Apps, although Rout says that support for other email platforms is on the way. Note that the Firefox extension does not yet support Firefox 5 beta. This is a really useful tool. I used to work in a corporate law firm and the amount of knowledge hidden in emails was insane. Something discussed just 2 months back between two people would not be available to anyone else. We had a plugin to send useful emails to a shared knowledge base but there was too much friction in clicking that (laziness + “oh, this is not really that imp”). So what Grexit is doing is really useful. Esp. the fetch rules make it easier and reduce the effort. I’m a Grexit user and can recommend it.